Two years ago, on a clear autumn morning, I caught the Cape Air from Boston to Provincetown, soaring a thousand feet above the Atlantic in a cold wind. I was on my way to Norman Mailer’s to spend a few days editing his latest novel, Hitler’s Phantom, a title that would change to Hitler’s Mother then, finally, The Castle in the Forest. I had a marked-up copy of the manuscript in my bag, and as I climbed out of the nine-seater Cessna, I thought about what I wanted to tell Norman. We had worked together on two previous books -- Why Are We at War?and the poetry collection, Modest Gifts -- but this was the first novel and his most significant book in a decade. Already he had devoted more than three years to it and would spend another ten months before setting down his pen. This wasn’t the first draft I had edited, and it wouldn’t be the last, but he was at a crucial point in shaping his narrative and I had a few suggestions to share. At the house I found Norman waiting in the dining room, his fists on the table as if he were holding up a knife and fork. His manuscript was out, his pencils sharpened. The man was hungry to get to work. People have often asked me: what’s it like to edit Norman Mailer? I know what they really mean. Does Norman Mailer take editing? The answer is straightforward: Yes, as much as anyone I know. He was always eager for a reader to engage him on the page and bring him a response. He had a small circle of literary pals who read his manuscripts early and he used our reactions as tuning forks. The only way I could have disappointed him as his editor was if I didn’t tell him the truth. Last Monday, almost two years later to the day, I caught the Cape Air from Boston to Provincetown. Nearly everything about the twenty-minute flight was the same: the clear morning, the sputtering Cessna, the cold wind white-capping the Atlantic a thousand feet below. Except this time there was no manuscript in the bag. A few days earlier I saw Norman for the last time in the hospital. On the visitor’s chair was a paperback copy of The Castle in the Forest. Next to it, his last book, On God. It's weird saying good-bye to someone when you know that’s what you’re doing. The moment is normal and yet packed with meaning but any attempt to define that meaning slips into cliché and borrowed language and tired imagery. Editorially, that won’t do. It was just a cold Thursday morning in a freaky ICU unit on the sixth floor of Mt. Sinai. Norman was asleep and when it was time to say good-bye I touched his arm and he opened those famous blue eyes. David Ebershoff is an editor-at-large at Random House. His new novel, The 19th Wife, will be published in 2008. 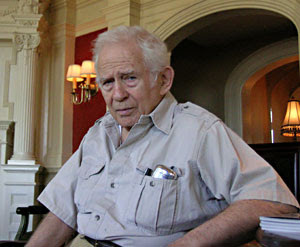 "Guest Post: David Ebershoff on Editing Norman Mailer" was posted November 16, 2007.